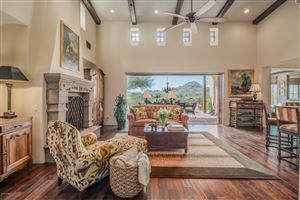 Single level home in Fountain Hills with views on a large hillside lot. 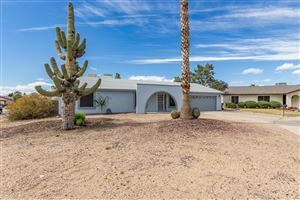 Amazing curb appeal & beautiful, easy-to-maintain desert landscaping. Impressive entrance & large foyer. Updated kitchen with granite counters, large eat-in area with tons of windows & a huge walk-in pantry. Great room has a fireplace & 2 separate entrances to the backyard. Large master suite with double door entry, huge walk-in closet, bathroom with extra storage, double sinks, separate shower/tub & private toilet area. Beautiful pool & spa with water feature boasts amazing views! Large indoor laundry room with utility sink. Tons of storage throughout. Oversized 2 car garage with room for workshop and/or storage. Long driveway with side entry garage. Property line extends past the fence. No HOA. The AC unit is a high quality 13-seer Trane unit and the owners recently had the ducting system for completely redone to improve energy efficiency and reduce electric bills. The propane tanks for the heated pool and spa and for the fireplace were recently replaced. This home has been impeccably maintained and is completely move in ready. Watch this short drone video to see the flow of the home and the great views! Contact me below if you’d like to schedule a private showing or if you would like more information about the home. My name is Becky Kitson-Davies and I am a FULL-TIME realtor. Discrimination is horrible and I simply will not discriminate against anyone. I'm a firm believer in the Golden Rule so I always treat people as I would like to be treated. Join my mailing list to receive the latest news and updates from me and my team.